In November 1886 Heinrich Hertz became the first person to transmit and receive controlled radio waves. Considering how indispensable his wireless transmissions quickly became, it seems a little odd looking back that he had no practical purpose in mind for the radio or Hertzian waves he discovered. His research was focused solely on discovering if James Clerk Maxwell’s 1864 theory of electromagnetism was correct. The first time Hertz thought seriously about proving Maxwell’s theory was in 1879, when he was a 22 year-old student in Berlin. He decided against it. It seemed too hard, and anyway he wanted to concentrate on completing his doctorate. In 1883, after getting his first lecturing job, he revisited Maxwell’s theory. He wrote an impressive paper, reworking the theory mathematically. In 1885 he moved to the University of Karlsruhe as a full professor of experimental physics. Now he decided the time was ripe to look for a way to prove Maxwell’s theory. In October 1886 Hertz saw an electrical spark, starting a train of thought that would end up transforming the world. Riess Spirals. Hertz saw sparks fly between the small metals balls. Hertz had been demonstrating a piece of electrical apparatus called Riess spirals to students. The spirals produced electric sparks by a process called magnetic induction. The sparks flew between spark-gaps – small gaps in circuits. Hertz became fascinated by sparks. 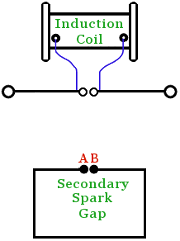 You can see a diagram of an induction coil connected to a spark-gap below. Playing around a little with this apparatus, Hertz connected a secondary spark-gap to the existing spark-gap, as shown. 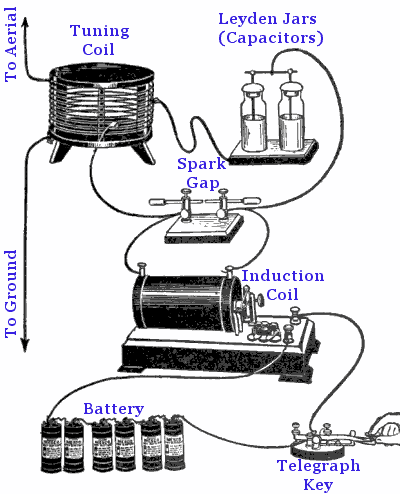 He used the induction coil to generate high voltage ac electricity, producing a series of sparks at regular intervals at the main spark-gap. Hertz found that when sparks flew across the main gap, sparks also usually flew across the secondary gap – that is between points A and B in the image; Hertz called these side-sparks. He found the behavior of the side-sparks highly thought-provoking. He varied the position of connection point C on the side-circuit. The only way he could stop side-sparks being produced was to arrange the apparatus so the length of wire CA was the same as CB. Given that the electricity was ac, this suggested to Hertz that voltage waves were separately racing through the wire along paths CA and CB. If the distances CA and CB were the same, then the same voltage must reach points A and B at the same time. The electrical waves in CA and CB were said to be in phase with one another, so sparks could not be generated. Sparks could only be generated if there was a large voltage difference between points A and B.
Distances CA and CB are equal. Voltage waves reach the spark-gap in phase with one-another. There is no voltage difference between A and B, so no sparks jump over the gap. Distances CA and CB are not equal. Voltage waves reach the spark-gap out of phase with one-another. 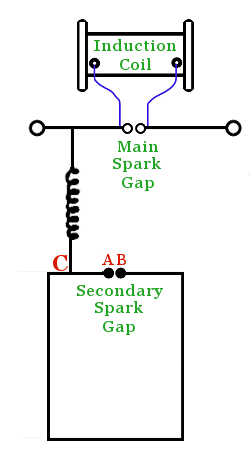 There is a voltage difference between A and B, so sparks jump over the gap. Hertz did more experiments which revealed that the sparking at the main gap was producing beautifully regular electrical waves, whose behavior was predictable. He pictured waves of electric charge moving back and forth, creating a standing wave within the wire. In other words, he believed the circuit was vibrating like a tuning fork at its natural, resonant frequency. He thought he now had a circuit in resonance. Of course, in Hertz’s circuit the vibrations were not of sound, they were vibrations of electric charge. It’s worth bearing in mind that resonance is not actually needed for electromagnetic waves to be produced – they’re produced whenever electric charges are accelerated. 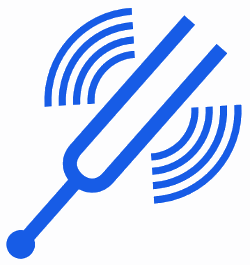 The importance of resonance is that if a receiver has the same resonant frequency as a transmitter, the incoming electromagnetic waves have a much stronger effect on it. This is similar to the situation in which an opera singer shatters a champagne glass because its resonant frequency is the same as the note she sings. Aware that the frequency of electrical vibrations and hence resonance is determined by electrical properties called inductance and capacitance, Hertz looked more closely at these factors in the circuit. He identified that a phenomenon called self-induction was taking place in the wires. This allowed him to deduce that the electric vibrations had an extraordinarily high frequency. Hertz decided to break the hard-wired connection between the main spark circuit and the side-spark circuit, as shown in the image. According to Maxwell’s theory, the main circuit would then radiate electromagnetic waves with a wavelength of about a meter. The actual apparatus is shown below. In November 1886 Hertz put together his spark-gap transmitter, which he hoped would transmit electromagnetic waves. Hertz’s spark-gap transmitter. At the ends are two hollow zinc spheres of diameter 30 cm which are 3 m apart. These act as capacitors. 2 mm thick copper wire is run from the spheres into the middle, where there is a spark-gap. Today we would describe this oscillator as a half-wave dipole antenna. For his receiver he used a length of copper wire in the shape of a rectangle whose dimensions were 120 cm by 80 cm. The wire had its own spark-gap. Hertz applied high voltage a.c. electricity across the central spark-gap of the transmitter, creating sparks. The sparks caused violent pulses of electric current within the copper wires leading out to the zinc spheres. As Maxwell had predicted, the oscillating electric charges produced electromagnetic waves – radio waves – which spread out at the speed of light through the air around the wire. Hertz detected the waves with his copper wire receiver – sparks jumped across its spark gap, even though it was as far as 1.5 meters away from the transmitter. These sparks were caused by the arrival of electromagnetic waves from the transmitter generating violent electrical vibrations in the receiver. This was an experimental triumph. Hertz had produced and detected radio waves. Strangely, though, he did not appreciate the monumental practical importance of his discovery. In fact Hertz’s waves would soon change the world. By 1896 Guglielmo Marconi had been granted a patent for wireless communications. By 1901 he had made a wireless transmission across the Atlantic Ocean from Britain to Canada. By the early 1900s technically minded people were building their own spark transmitters at home. Even children got in on the act, with instructions to build a transmitter appearing in a craft book for boys in 1917. By the late 1920s most radio transmitters were using vacuum tubes rather than sparks to generate radio waves. And then the vacuum tubes were abandoned in favor of transistors. Scientists and engineers have continued to innovate quickly in the field of radio technology. Radio, television, satellite communications, mobile phones, radar, and many other inventions and gadgets have made Hertz’s discovery an indispensable part of modern life. Great people, great world. Scientists are immortalised through history and their inventions. Great work! Thank you! I had wondered how something so invisible had been discovered. Not only do you it explain it well, but I see how a love and understanding of music ( tuning fork), and the ability to “play” contributed to this discovery. I have recently come across this website and found it very much useful and inspiring. WhenevernI get some free time out of my work, I start reading the stuff. Thank you for putting a history of the modern scientists together in one place. I find this site very useful, thanks a lot. A must see website for science s fan. Thank you so much for all these biographies in one place.You save me a great amount of time reviewing all Electromagnetic contributors.